No other injuries were reported, though the man had pointed the gun at two people in the house who were led out by police before the shootout. 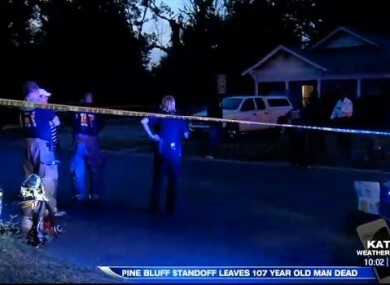 A 107-YEAR-old Arkansas man was killed during a shootout with US police and SWAT team members, local authorities said. Police were responding to a disturbance at a house in Pine Bluff city Saturday afternoon and determined that suspect Monroe Isadore had pointed a gun at two people, according to a statement given to local media. The two victims were led out of the house. As the officers approached the bedroom where Isadore had taken cover, he shot through the door. Isadore failed to injure any of the officers with his gunfire. Supervisors began negotiating with Isadore and a Special Weapons and Tactics team was called out. Using a camera inserted into the room, the SWAT team was able to confirm that Isadore was armed with a handgun. The officers then slipped gas into the room before Isadore responded with gunfire. “Shortly afterwards, a SWAT entry team inside the residence breached the door to the bedroom and threw a distraction device into the bedroom,” the Pine Bluff Police Department statement read. The statement did not say which type of distraction device was used. Law enforcement officials are investigating the incident. Email “107-year-old man killed in shootout with US police”. Feedback on “107-year-old man killed in shootout with US police”.